Technological advances have revolutionized vascular noninvasive imaging over the past two decades. 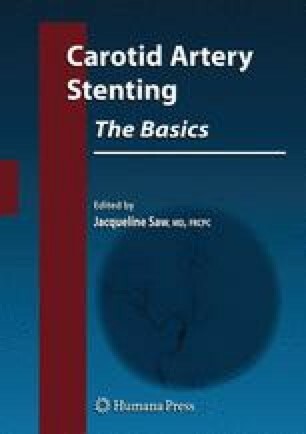 There are now several options aside from conventional angiography to image carotid artery stenosis. These modalities are constantly evolving, and this chapter will review CT angiography, MR angiography, and carotid Doppler for noninvasive carotid artery imaging. U.S. Food and Drug Administration Information for Health Professionals: Gadolinium-based contrast agents for magnetic resonance imaging ( marketed as Magnevist, Multihance, Omniscan, Optimark, Prohance). Available at: http://www.fda.gov/cder/drug/Infosheets/HCP/gcca_200705HCP.pdf. Last update May 23,2007. Accessed July 24,2007.